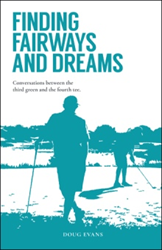 “Finding Fairways and Dreams: Conversations between the Third Green and the Fourth Tee” (published by Balboa Press AU), a new sports novel by Doug Evans, explores personal development through the power of having a caddy figure to serve as a mentor, guide, protector, psychologist, manager and friend. “We can all improve our performances and the enjoyment of our lives by changing our state of mind using the guidance of a caddy figure,” Evans declares. Narrated by a friend of the main character, Davey Neilson, “Finding Fairways and Dreams” shows how Davey, a caddy, inspires and enriches the lives of those around him. At times throughout the various stories it seems that Davey is able to influence other people and their personal development almost supernaturally. Late in the book, the novel reveals a link between Dave and the narrator’s great uncle, Doug Nanfield, who was executed in WWII. Doug Evans grew up in Australia, where sport is a prominent part of life. Golf has been a lifelong passion for him, one that has sustained him through tough times. He has worked in a number of corporate executive roles, beginning in HR and progressing to CEO in multiple large business across a range of sectors. He currently lives in Queensland, Australia.